Pork and bacon pie with an accompaniment of piccalilli. What exactly is Piccalilli? Piccalilli is a kind of Indian pickle that has been a staple of the British pantry for the past 200 years. The Oxford English Dictionary indicates that early uses of the word in Britain include Anne Blencowe’s Receipt Book from 1694 and Hannah Glasse’s cookbook from 1758. These are some of the ingredients for an Indian pickle written down in 1765. By this time, the East India Company had familiarized the well-off with “chatnis” (chutneys) from the East. In Piccalilli, the mustard acts as a preservative as well as the vinegar. This recipe comes from Oxburgh Hall in Norfolk where they pickle seasonal vegetables from their kitchen garden. 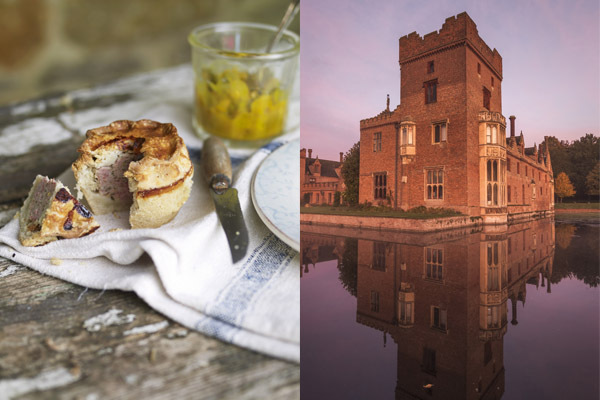 This recipe comes from the kitchens at Oxburgh Hall in Norfolk. 1. Layer the prepared vegetables on a large plate with the salt and leave overnight covered with a cloth. 2. Next day, drain and rinse the vegetables under cold running water, then dry well. 3. Stir the mustard, ginger, and sugar in to most of the vinegar in a large pan, retaining just enough to make a thin paste with the corn flour and turmeric. 4. Add the vegetables and simmer until you have a texture you like; crisp or less crisp—your choice. 5. Add the corn flour and turmeric paste to the pan. 6. Bring to the boil, stirring carefully, and boil for 2-3 minutes. 7. 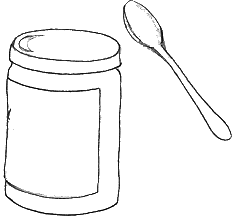 Pour into warm, sterilized jars and cover with a cloth. 8. Leave until complete cold and then seal. Store this in a cool dark place for 2-3 months before using. 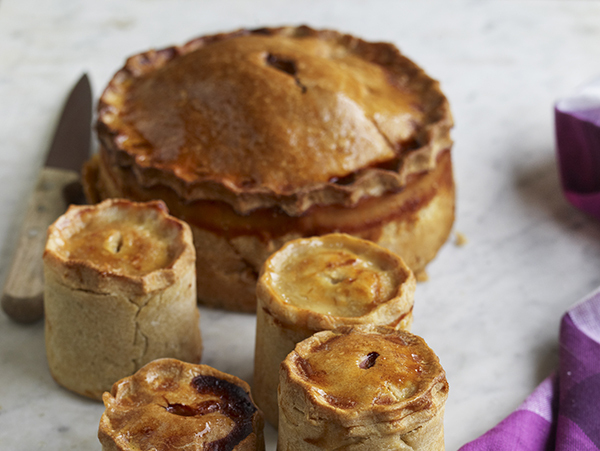 Laura Mason in The National Trust Farmhouse Cookbook writes: “In the past, pork pies showed local variations in recipe and method and a good pork pie was a source of pride to a housewife or local butcher. Melton Mowbray in Leicestershire still produces a distinctive pie, and this recipe incorporates elements of that tradition – anchovy essence as a flavoring and fresh meat instead of brined. 2. Cut a quarter of the leanest pork into ½ inch-sized cubes. Mince the rest coarsely. This is best done by hand with a sharp knife, as a mincer will compact the meat. Add the seasonings and turn well so they are evenly distributed throughout. 3. Put the flour in a large bowl and add the salt. Measure the water into a pan and add the fats. Heat the pan, stirring, until the water has come to the boil and all the fat has melted. Remove the pan from the heat and stir the mixture into the flour. Use a wooden spoon at first, then as it cools slightly, knead to make sure it is all incorporated properly. Cover the bowl and keep it in a warm place. To raise the pie, take ¾ of the pastry, still warm, and shape it into a disc. Put it in the cake tin and quickly raise it up the sides to the top, making it as even as possible and trying not to get the pastry too thick. The dough should be malleable – if it flops, it is too warm. 4. Once the pastry is raised, pack the filling into it. Roll out the remaining quarter to make a lid and brush the edges with beaten egg. Trim any excess and crimp the edges. Make a small hole in the middle and cover it with a pastry rose. Cut leaves from the trimmings, and use them to decorate the top of the pie. Brush with beaten egg. 5. Bake at 200°C/400°F for 30 minutes, then lower the heat to 170C, 325F and bake for another 1 ½ hours. Some gravy may bubble out of the pie, but don’t worry too much about this – some recipes cite this as an indication that the pie is cooked. 6. 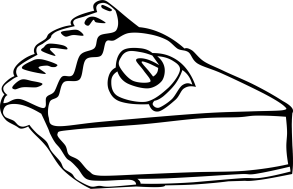 At the end of the cooking time, remove the pie from the oven and allow to stand for 20 minutes. If the jellied stock has cooled off, reheat to boiling. Ease off the pastry rose and pour in as much hot stock as the pie will hold. Replace the rose and allow the pie to cool. Wait 24 hours before cutting.